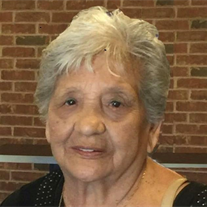 Maria Eusevia Arguijo Treviño, 85, peacefully passed away, Saturday, February 4, 2017 after a five year battle with cancer. She was surrounded by her family. Eusevias feisty sense of humor always brought smiles to those around her If you wanted to know who her favorite was, you just asked her and she would let you know…it was you. Eusevia was cherished by so many and each person was touched by her compassion and the way she genuinely and freely gave her unconditional love. She is being reunited with her husband Andres Treviño II, mother Concepcion Chapa Arguijo, father Fidencio Arguijo, great-grandson, daughter-in-law and six siblings. Eusevia is survived by sons, Floyd Treviño and wife, Rose, Andres Treviño III and wife, Anita, Elogeo Treviño and wife Pauline, Noe Treviño, Freddy Treviño and wife Terry, Roger Treviño and wife Bernadette, Robert Treviño, Arthur Treviño and Danny Treviño and wife Megan; daughters Ester Williams and husband Larry, Estella Hughes and husband Sam, and Sylvia Perez and husband, Raymond; brothers, Trinidad Arguijo and wife Hortencia, Vivian Arguijo and wife, Aurora, sister, Oralia Gonzales and husband, Juan; 35 grandchildren; 41 great-grandchildren; extended family and countless friends.